Heavy Duty Vulcanized 4mm compressed density Neoprene BARE Boots. Repair, Replace, or upgrade your old worn out drysuit boots with the HD Vulcanized Neoprene Boots. Can be used on any type of drysuit that will accept a neoprene sealing surface (which can be done on most suits with Aqua Seal or Neoprene Cement). 4MM high-density neoprene maintains consistent thermal protection at varying depths keeping you warm regardless of your dive profile. Vulcanized rubber covers the entire boot up to the ankle. Integrated fin tab to prevent fins strap from slipping off boot. Extra (Vulcanized Rubber) reinforcement on the toe, heel cap, and sole; which improves the overall durability, protection and comfort of the boot. XS: USA 6 S: USA 7 M: USA 8 L: USA 9 XL: USA 10 2XL: USA 11 3XL: USA 12 4XL: USA 13. Water Rescue / MT Dive Tech makes every effort to provide an accurate description of the items. We are a professional dive retailer / store. All of our E-bay items are also for sale in the physical store. Add me to your Favorites list. Thank you for your business! Check back often for new products being added weekly. 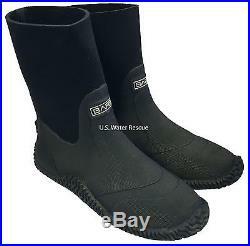 The item "Drysuit Boots Heavy Duty Vulcanized 4mm Compressed Neoprene, BARE Scuba Dry Suit" is in sale since Tuesday, October 04, 2016. This item is in the category "Sporting Goods\Water Sports\Wetsuits & Drysuits\Drysuits". The seller is "waterrescue_divetech" and is located in Billings, Montana. This item can be shipped to United States, Canada, United Kingdom, Denmark, Romania, Slovakia, Bulgaria, Czech republic, Finland, Hungary, Latvia, Lithuania, Malta, Estonia, Australia, Greece, Portugal, Cyprus, Slovenia, Japan, China, Sweden, South Korea, Indonesia, Taiwan, South africa, Thailand, Belgium, France, Hong Kong, Ireland, Netherlands, Poland, Spain, Italy, Germany, Austria, Israel, Mexico, New Zealand, Philippines, Singapore, Switzerland, Norway, Saudi arabia, Ukraine, United arab emirates, Qatar, Kuwait, Bahrain, Croatia, Malaysia, Brazil, Chile, Colombia, Costa rica, Dominican republic, Panama, Trinidad and tobago, Guatemala, El salvador, Honduras, Jamaica, Antigua and barbuda, Aruba, Belize, Dominica, Grenada, Saint kitts and nevis, Saint lucia, Montserrat, Turks and caicos islands, Barbados, Bangladesh, Bermuda, Brunei darussalam, Bolivia, Ecuador, Egypt, French guiana, Guernsey, Gibraltar, Guadeloupe, Iceland, Jersey, Jordan, Cambodia, Cayman islands, Liechtenstein, Sri lanka, Luxembourg, Monaco, Macao, Martinique, Maldives, Nicaragua, Oman, Peru, Pakistan, Paraguay, Reunion.